Solar power is already making a huge improvement on different vehicles and letting automotive engineers run wild with futuristic designs. You might remember the electric eVe car from last year that holds a speed record for fastest vehicle using solar power. And don’t forget that Solar Impulse 2 is about to finish up its flight around the world for another solar powered record. Yes, solar powered vehicles are making history all right. But this next story takes the cake for ingenuity … and a little creative engineering. 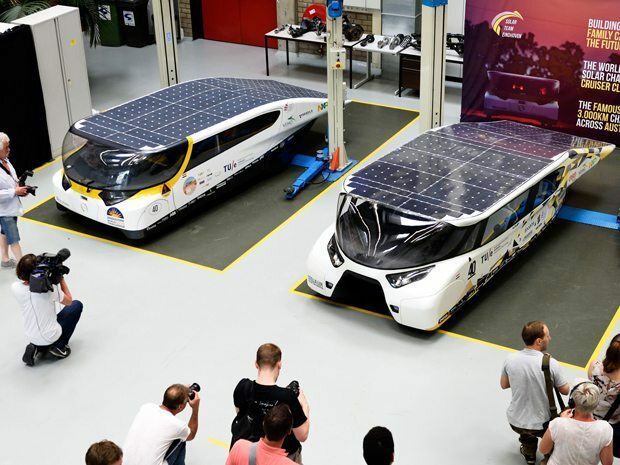 A team from the Netherlands has created a solar powered car that not only generates more power than it takes in, it can also seat a family of four comfortably. Introducing the “Stella Lux”. This car, along with its earlier 2013 model, looks like something out of a sci-fi movie set in the future. According to IEEE Spectrum, it features a “tunnel” that runs through the bottom center of the car to improve aerodynamic efficiency. This design is meant to cut down on weight as much as possible. Despite their futuristic design and efficiency, solar powered cars still need some improvements when it comes to pulling power. Speaking of power, the Stella Lux carries a 5.8 square meter array of solar panels on the top to feed the car and charge 15 kWh of onboard batteries. When it’s charged, the car has a range of about 1,100 kilometers (or about 650 miles!) before it needs recharging. And despite the crazy design, their promotional video shows four passengers enjoying the ride without a hitch. But what’s most impressive about Stella Lux is that it’s energy positive: on average, the car uses less energy driving than it produces during the day, even in a place like the Netherlands where it’s not constantly sunny. Depending on weather, the daily range of the car on solar power alone varies between about 50 km and 300 km (between 30 miles and 185 miles! ), and driving any less than the daily max solar range results in a surplus of energy that can be returned to the grid. This October, Stella Lux and her team will be competing in the Cruiser Class of the 2015 Bridgestone World Solar Challenge, a nearly 2,000 mile race through the Australian Outback. The engineering team for Stella Lux is already gearing up for the race and ready to make some history. Let’s keep these creative, crazy-looking cars coming!